We really like the approval feature on Pull Requests, but we hit a situation today where I had approved something, then changes were made (new commits) but my approval remained, despite me having never seen the new changes. We think it would be great if all approvals were reset when new commits are made to a pull request, otherwise we'll simply not use the feature. Merge checks allow you to reset approvals when the source branch of a pull request is modified . 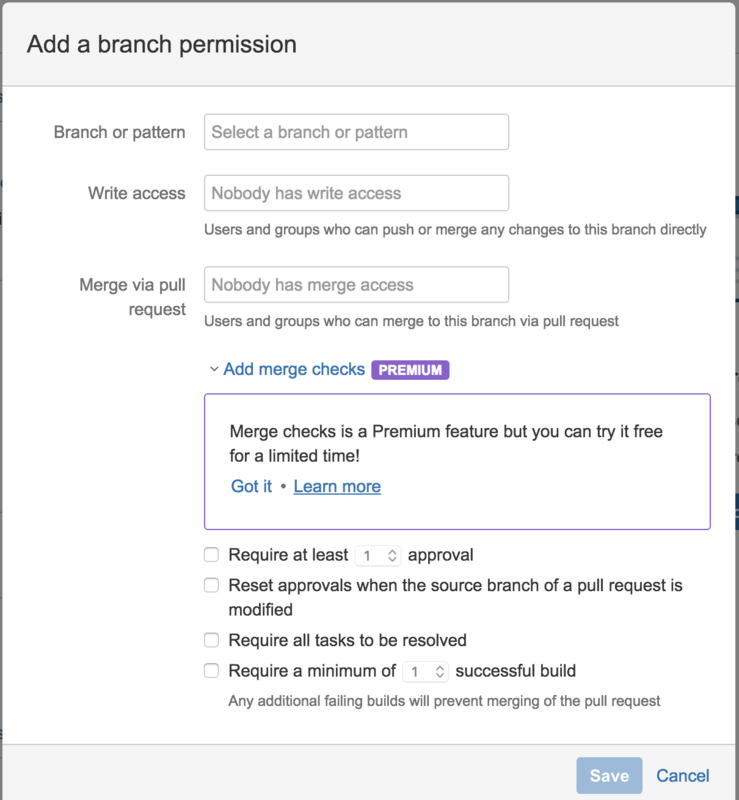 All Bitbucket accounts can use merge checks today as part of a trial for Bitbucket Premium. +1, had the same situation and thoughts today. I really can't understand how approvals functionality was implemented without this obvious thing. Without this the approval function is unusable because it misleading. And I believe this is not rocket science issue. This issue (which waiting more than 1 year) can be made of 1-3 lines of code. Issue #10309 was marked as a duplicate of this issue. This is a critical feature for our current workflow. As a maintainer of a number of projects hosted on bitbucket, it's incredibly difficult for me to keep track of whether participants have accurately reviewed the pull request. There is definitely a clear mental disconnect presented with the feature as currently implemented: if I approve a pull request, I have indicated that I have read it/checked it/run the code/etc and agree that it does what it says it does, and agree with the author of the patch(es). If I approve something, and the underlaying code changes, I am now placed in an awkward situation where I've given my go-ahead but have no idea what I've signed off on anymore (the newly updated commits could COMPLETELY change the PR in the worst case). As the maintainer in many of these cases I become more of an "arbiter" (as I only have commit access to the master repo), and so I need to depend on my team to properly review the incoming code before merging in. The way the reviews currently work, I need to check in with the team members almost constantly to make sure that they have checked every mutation of the PR as things are being fixed based on points brought up in the discussion. +1 New commits could introduce bugs so the pull should go back to an unapproved state. If you don't want to change existing behaviour, at least make it an option in the repo settings. +1 Would love to have approvals reset when new commits are added. +1 Please consider adding this feature soon. +1 This would be really appreciated. This would be a very helpful feature. Please consider adding it ASAP. Nice to have and useful feature. This is not even a feature request, it is a loophole fix. I would advise everyone voting for this to invite your colleagues to vote as well. As it stands, it is still too low in the voting ranking of issues. +1 This would be a really useful feature for teams with many reviewers. +1 This is an issue for us as well, makes this feature un-usable currently. This is a duplicate of https://bitbucket.org/site/master/issues/7667/further-commits-on-a-pull-request-should - the votes should be combined. +1 This is very useful! +1 This feature is what I need! +1 This would be a very helpful feature. Please consider adding it ASAP. +1 As I said on #7667, before seeing this one that had more up-votes, Code Collaborator has had this feature for 5 or 6 years, at least. It's hard to take a code review tool seriously if it doesn't support such a basic work-flow as this. For those who do not know, there is an Atlassian plugin for installable versions of Bitbucket, but not the cloud version. See https://jira.atlassian.com/browse/BSERV-2918 This functionality was added to the Atlassian Labs Auto-Unapprove plugin on marketplace and is not included in Stash's core offering. Please install that plugin if you'd like to automatically remove the approval of any reviewers on a push to the source branch. This has been available since 2013/03 !!!! Why are cloud users being punished??? +1. Got burned by this today. Issue #7667 was marked as a duplicate of this issue. Thanks, Ben, it's great to see input from staff on this. Anything happening in BB-6784? Yes, nice to have the bookkeeping all neat and tidy, but it's been three years. Anything of substance you can share with us? This is burning us as well. We have code that "appears" to be approved and reviewed but actually is not. When reviewing new changes the reviewer should not have to wade through all the code they've already reviewed/approved again. It would also be wildly helpful if I manually merge a PR into master on my local machine using Git (not within the PR interface in bitbucket) that Bitbucket learns about this and marks the PR as merged!! The activity tab already has most of the things you list. Also, when I merge a branch that has a PR manually to master and push it, bitbucket does mark the PR as merged. @Michiel van Baak True except the 4th point is interesting... a consolidated interdiff of every commit that has happened since you approved (shown only to you, if you approved earlier) would be fantastic. Is there a way we can fund the development of this feature? @tuchk4 thanks, it was actually more critical for the projects on our BB server. I guess we'll just have to wait for it for our cloud ones, or port them to our server install. I agree with the feature but would like to be able to exclude syncs with the source/target branch. We have devs sync often. Syncs from the ui or merges from parent branch? How would that work? If no conflicts, approvals stay otherwise remove approvals? That would work but reflecting on the feature some more I think I'd just take it as described and teams would just need to get through their approvals without a sync. Good news: this should be available as an opt-in feature in the next month! We'll post at https://blog.bitbucket.org/ when it's live. Unfortunately we've hit a snag, and this feature will be delayed. I'm truly sorry for the delay - we're making an effort to communicate better, and I recognize this is frustrating. I'll post updates here when we have more to share. Just wanted to say that this feature would be a great addition. +1 - Are there any updates on adding this feature? Last update was July 20, 2016? Any thoughts on when this will be completed? This issue was opened on 2013-04-12. That's 3 years ago..
@benechols Any news on this? It has been over 2 months since the last update. I don't know what snags have been hit but if the only thing that was implemented was that "Pushing new commits to an already-approved PR should remove the approved status" I would be happy. Obviously updates to activity and lists of what needs to be approved since the last approval would all be nice, but the crux of our organization's issues lies in approvals remaining after adding commits. "Pushing new commits to an already-approved PR should remove the approved status" I would be happy... the crux of our organization's issues lies in approvals remaining after adding commits. Continuous improvement beats postponed perfection. Its really disappointing that a huge company like Atlassian take more than 3 years to respond to such a simple feature request, especially when so many of their users want it so badly. It makes me want to consider switching away from every single Atlassian product that my company currenty uses because Atlassian clearly don't care about their customers at all. "Unfortunately we've hit a snag," what? you removed every single checkout of your repository, etc etc and have to rebuild everything by hand line by line now as all you have is a binary? Can't be anything else as there's not a single update after this for months now. It's like a bad Kickstarter. Atlassian clearly don't care about their customers whatsoever, we've been requesting to change the JIRA URL for MORE THAN 2 YEARS now and it STILL hasn't been done. We should all just abandon Atlassian products and switch to something else where they actually care about their customers and listen to what they have to say. Atlassian is by far the worst company in the entire world. Thanks @Michiel van Baak, Yeah. it would be cool if when our approval is redacted that the green check mark icon on our picture changes to a yellow icon / hyperlink to the diff of the changes after our last approval. We just started using pull requests on Bitbucket Cloud instead of using Crucible and I am very surprised that this has not been implemented yet. There seem to be lots of great features that have been implemented in Crucible and/or Bitbucket Server but not Bitbucket Cloud. Is this the same as the new github premium feature just announced? "Merge checks – Another premium feature now available in a free trial allows you to enforce code reviews so you never have to waste time backing out changes." Merge checks – Another premium feature now available in a free trial allows you to enforce code reviews so you never have to waste time backing out changes. Frankly, I don't see how one can have a code review enforcement feature worth anything at all when the loop hole that this ticket represents is hanging wide open. As I said two days ago, it's like a bad Kickstarter: feature creep, charging more for stuff nobody asked for, and the basics still languish with effectively zero communication given. @Michiel van Baak in terms of the "See what's changed" link, this would be super useful if standard practice for your organization isn't get a code approval, rebase onto master, merge changes. That rebase throws the usefulness of that link right out the window. OK, Finding that out. Do you have recommendations for places that are easy (besides Café Rio)? Troy Black Software Engineering Manager, Training DealerSocket, Inc.
Will this Merge Checks feature be coming to Bitbucket Server, as well? Perhaps it is in a more recent version that I have missed, but just wanted to be sure. Thanks! There is already a plugin to do it for Bitbucket server, which works better than the implementation for Bitbucket cloud. Ashley Kleynhans, can you tell me plugin name and url for the plugin? He might have been referring to a plugin called "Bitbucket Server Auto Unapprove Plugin". I have not had a chance to try it out yet, but the plugin's description on the Atlassian Marketplace seems to suggest that it solves this problem. Tom Catullo, Thanks so much. That plugins works well.